Dodgers prospect Julio Urias impresses in his first live batting practice session. GLENDALE, Ariz. — Julio Urias gave the Dodgers so much to like in his first live BP session of the spring Sunday, it’s worth focusing on the present before dreaming about the 18-year-old’s future. Urias is expected to begin the season at Double-A. At least, there have been no indications otherwise to this point from anyone within the organization. So how does Urias compare to most Double-A pitchers? Watch: Julio Urias strikes out Joc Pederson, Chris Heisey, Alex Guerrero in live BP. GLENDALE, Ariz. — Dodgers pitcher Julio Urias threw approximately 40 pitches over two “innings” to live hitters for the first time in spring training Sunday. 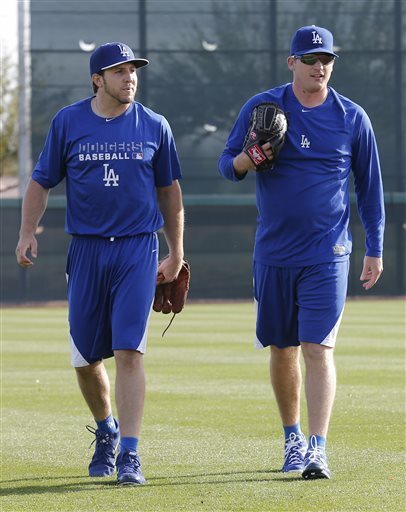 The 18-year-old left-hander struck out four batters: Alex Guerrero (twice), Chris Heisey and Joc Pederson. Urias then struck out Guerrero and got Heisey to ground out in the area of the second baseman. Here are all 18 pitches he threw in the second “inning,” including the strikeouts of Guerrero and Heisey. He also faces O’Koyea Dickson in this inning and induces a pop-up toward second base. The inning ends with a planned pitchout as Pederson stands in the box.